A Botongon, Estancia, Iloilo registered fishing boat was apprehended for violation of Republic Act 10654. 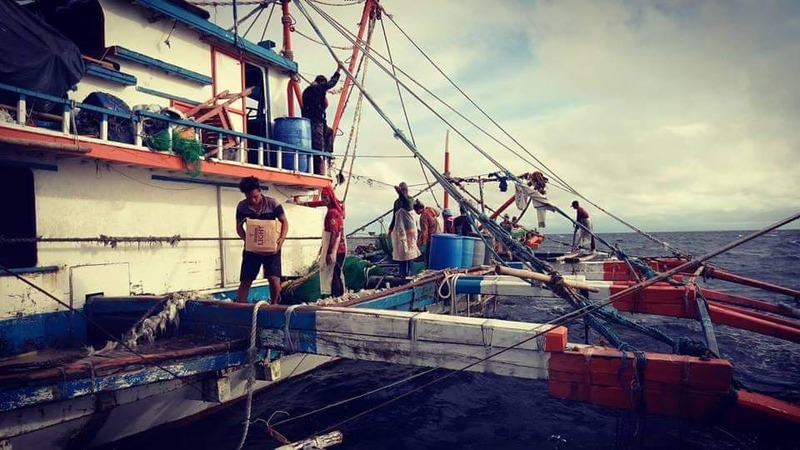 Legazpi City, [11.10.18] – At least 20 fishermen who are working as fishing crews on a Botongon, Estancia, Iloilo-based fishing boat were apprehended on Friday by Milagros Municipal Bantay-Dagat Task Force. The apprehended marauding Ilonggo fishing vessel F/B Toto Junar by Milagros Bantay Dagat Task Force off the waters of Guinlutangan, Milagros, Masbate on Friday afternoon. Photo by Milagros Municipal Police Station sent through the efforts of Jet Ramos. According to a report reaching Camp BGeneral Simeon A. Ola from Milagros Municipal Police Station, a seaborne patrol operation has apprehended twenty fishermen on board F/B Toto JUNAR, a report said. The elements of Milagros Municipal Police Station led by PO3 Mar A. Mortel under the direct supervision of Police Chief Inspector Rodel C. Arevalo, Officer-in-Charge, Milagros Municipal Bantay-Dagat Task Force led by Sangguniang Bayan Member Romeo “Kiko” Delgado and personnel from Provincial Fishery Office- BFAR Masbate led by FRO1 Efraim Mendoza arrested the crews of F/B Toto Junar who were conducting illegal fishing activity at 3:00 o’ clock in the afternoon in the seawaters of Barangay Guinlutangan, Milagros town. The Bantay Dagat Task Force confiscated an assorted catch more or less 150 kilos, using an active fishing gear “Danish Seine” locally known as (zipper or hulbot-hulbot) with a gross tonnage of 34.68 and net tonnage of 23.58 from the possession of the fishing crew. Ronald Alovera y Onera, 29 years old, crew, single and a resident of Barangay Libas, Roxas City. The apprehended fishermen were already charged for violation of Violation of Republic Act 10654 (Illegal Fishing) including Letecia Alombro the owner of F/B Toto Junar who is at-large. “Hulbot-Hulbot” or Danish Seine and Modified Danish Seine is banned in the Philippines under Bureau of Fisheries and Aquatic Resources [BFAR] Fisheries Administrative Order No. 246.